The stock strategist who predicted the S&P 500’s latest plunge now expects further declines as Treasury yields rise. 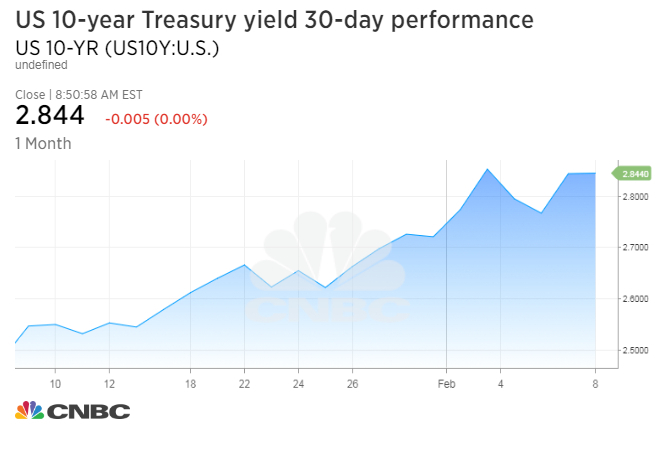 Barry Bannister, Stifel’s head of institutional equity strategy, said late Thursday that “the next shoe to drop” may be an increase in the 10-year Treasury yield versus the fed funds rate. “When the 10-year [yield] crosses 2.90 percent my thinking is traders panic and we get our bottom with a big sell-off in FANG,” Bannister said in an email. He was referring to the acronym for the big technology-related stocks, Facebook, Amazon.com, Netflix and Google’s parent Alphabet, that have played a significant role in recent stock market gains. Stifel’s Bannister said on Jan. 26, the day of the S&P’s record high, that stocks will correct at least 5 percent this quarter as the Fed and other central banks tighten monetary policy. The S&P 500 would go on to drop 10 percent from there through Thursday. The 10-year yield hit a four-year high of 2.885 percent Monday, helping trigger the S&P 500’s worst day since 2011. The yield came close to that level again Thursday. The benchmark yield was near 2.83 percent Friday morning. Stock index futures were pointing to a mildly higher open. “I know SPX corrects in about 5.56 percent increments so that would be the 200-day moving average or about 2,540 with some room for modest overshoot,” Bannister said. “I think the trigger for this sell-off was the Congress (Senate) approving over $300B of new discretionary spending above existing tax cuts [Wednesday] night. With all that fiscal fuel the Fed has to lean against it,” Bannister said in an email. The central bank expects to raise interest rates three times this year, but some traders are predicting more hikes. The Fed is also in the process of unwinding a massive stimulus program implemented in the wake of the financial crisis, while other major central banks are cutting back on easy monetary policy. The stock market sell-off accelerated after last Friday’s jobs report showed wages increasing at their fastest annual pace since 2009, adding to worries about rising interest rates. — With reporting by CNBC’s Fred Imbert.